Shopping List! The following are essentials needed for the upcoming week, which I purchased at Rite Aid with my "Wellness Card." Thinking: What are the benefits of having a wellness/rewards card anyway? I still spend more than I want to, every time. 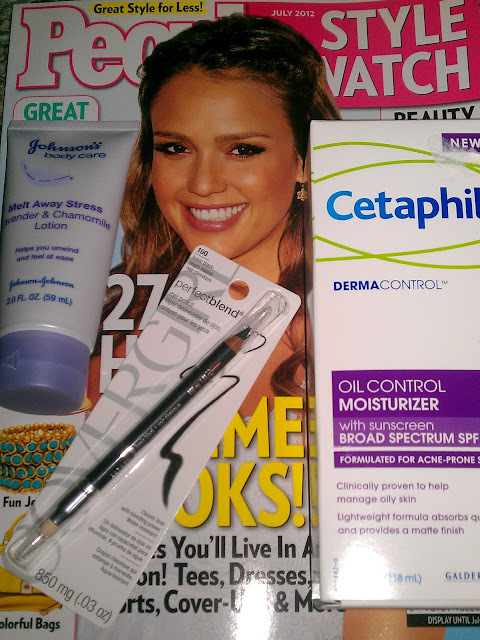 Cetaphil Skin Care products are great. And easy on my sensitive skin. But this is the first time that I will use the featured Cetaphil product with sunscreen SPF 30. I figured that I would try it, especially with summer literally right around the corner. Psst! Protecting your skin from the sun's harmful rays is an absolute must! Next up, CoverGirl makeup! I've used most products on the CoverGirl line and really like them. I do not wear loads of makeup - but when I do wear some - I like it to look natural, soft and pretty. CoverGirl makeup will simply accentuate your already beautiful features. And Don't Forget To Moisturize! I make sure my hands are moisturized around-the-clock ... and keep a bottle of Johnson's hand lotion in my purse (and on my desk at work). I'm a germaphobe and wash my hands constantly! After washing your hands it's smart to moisturize them in efforts to prevent the skin from becoming dry and brittle. Finally, the July issue of StyleWatch is on newsstands. How could I not? What items DO YOU splurge on? Tell me on Twitter.